Symbolic of the rich legacy of the country, Indian Sarees are the traditional nine yards of fabric that women in India have worn for centuries. Ranging from the simple handloom cotton weaves that are chic and legendary, to the contemporary and stylish modernistic versions, Saree is one Indian dress that would inevitably make you look every inch a poised Indian beauty that you are. 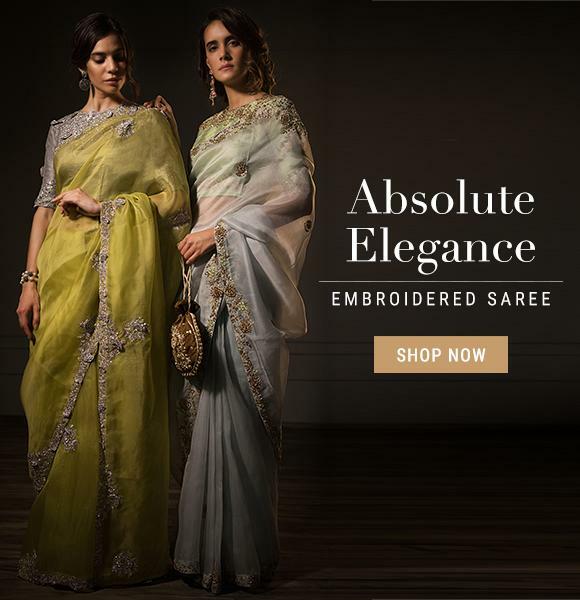 Shop online for Sarees at kalkifashion.com and explore our huge collection of latest and fashionable, exclusive designer and stunningly beautiful artisan Sarees for sale. Traditionally, the saree is usually worn by draping it lengthwise around the body, creating layers and pleats. It is wrapped around an undergarment known as the “petticoat”, which is fastened around the waist and a blouse, which is trimmed above the waist, leaving the midriff visible. This whole ensemble is collectively known as a Saree. In India alone, there are more than 80 different ways to drape a Saree. This diversity of draping style is simple due to the diverse cultural heritage of India, where every tribe, caste, creed and communities have their own style of draping a Saree. 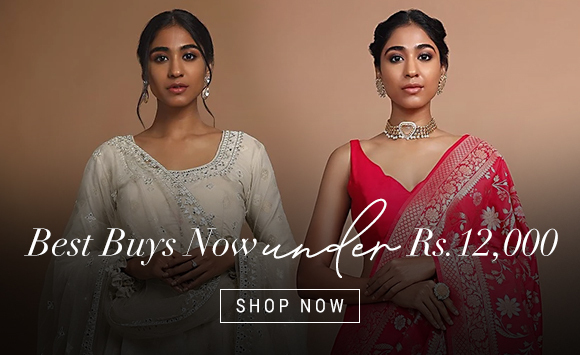 With the advancement of e-commerce and online shopping sites, shopping for Indian Sarees online has become a lot easier. Nowadays you don’t even have to painstakingly make rounds at your local stores and shops to find your dream Saree. Just sit back at the comfort of your home and browse through our fashionable and highly curated collection of Indian sarees in all their glory and variety, only on Kalki. Buying Sarees online has never been easier and safer! And the best part is that, you don’t even have to worry about size issues with sarees as their versatility allows them to be the worn by any lady, regardless of their body shape and size. So don’t wait any longer and check out our latest and fashionable collection of designer Indian Sarees at Kalki. You can find every kind of Sarees here, from plain white and gold saree to exclusive designer sarees. Here, at Kalki we strive to present and represent the rich and gorgeous culture of our nation’s ethnic wear. Buy Indian sarees online, in a plethora of designs and fabrics only at kalkiFashion.com. Saree is a traditional Indian outfit that is worn by women of different ages, be it a college girl, a working lady or a housewife. The charm of a saree is increasing every passing day due to its sensual appeal and aura that truly transform an Indian woman to a gorgeous diva. An Indian woman looks splendid in a saree and when it is a special occasion like a party, festival or a wedding, it is this gorgeous attire that takes the centrestage and the limelight is upon you. KalkiFashion with its experience in designing various Indian outfit, offers the best in designer collection to the fashionistas who have an understanding and liking for gorgeous Indian clothing and ethnic Indian wear for women. Browsing through the impressive collection of Indian attire for women at Kalki store, you get a first-hand experience and glimpse of the variety, colors and design that is exceptional from the word ‘go’. It is for all the fashionable ladies like you, who love to flaunt their beauty through a graceful attire like a saree in exceptional design. Today, one can choose from an impressive range of designer sarees, bridal sarees and printed sarees that are flawlessly designed and produced by hand. Indian sarees are mostly inspired by the traditional floral prints and motifs like tendrils, flowers like lotus, and animals and birds like elephant and even peacock. In most of the areas the designs of temples are diversely incorporated into the sarees. It is to be noted that the drape from Madhya Pradesh like the ‘Maheshwaris’ has come up with the chequered window like design that is a very distinctive feature of this particular type of saree. You get to see every type of saree to fulfill your desires here at Kalki Fashion.